Following the impact of Hurricane Wilma in the state of Quintana Roo, Mexico in late October 2005, and subsequent impact in Florida I and two other professionals visited Quintana Roo, at the request of the state government to conduct damage assessment in the most affected region. Based on a full week of intensive field work in Cancun, Playa del Carmen, the Maya Riviera, and the island of Cozumel in November 2005, I wrote a report of findings for the Governor and other authorities of Quintana Roo, which I delivered during the first quarter in 2006. Several working meetings and conferences to discuss my findings with civil defense and emergency management authorities, and state legislators followed in 2006. During this process, and idea began to take shape in my mind: the report of findings I had written and the tremendous interest it generated throughout Mexico demonstrated I had the basis to write a book and there was a market for it in Quintana Roo and other hurricane-vulnerable places in Mexico and elsewhere. Drawing on my professional background, field and research experience, and my years of teaching two graduate courses on Vulnerability Assessment and Hazard Mitigation, using the Quintana Roo report of findings as the foundation, my idea became reality in 2012 with my book Paraiso Protegido: hacia una cultura de mitigacion, (‘Paradise Protected: toward a culture of mitigation’), ISBN 978-607-401-556-0 published in Spanish by M.A. Porrua, Mexico DF, Mexico. However, I must admit that even as I was writing that book I was already thinking of publishing an English version to share this knowledge with a wider audience. As I engaged in the writing and editing of what started as a translation of the book in Spanish with my publisher, CRC Press, it became clear to me and my editor that this book in English was really a new work. There was plenty of new material to incorporate, new topics to discuss, new illustrations, new questions to ask or answer. 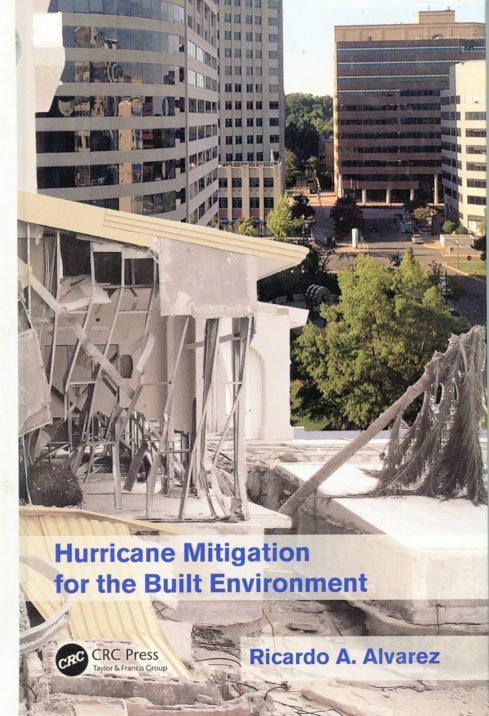 The end result of this process is my second book Hurricane Mitigation for the Built Environment, ISBN 978-1-4987-1498-3 published in 2015 by CRC Press – Taylor & Francis Group, Boca Raton, FL, New York, NY, Abingdon, Oxon, UK. The books has kept the core discussion on hurricane impacts and damage to the built environment based on my field work in Quintana Roo, but this is complemented with numerous examples from hurricane-related work and research here in Florida. The final chapter in the book, Chapter 14 – Climate Change: An exacerbating factor discusses the linkage between climate change and hurricanes, and offers an in-depth discussion of such topics as sea level rise, storm surge, and wave impact, that are so relevant to coastal communities.